Princess and Thomas were fascinated by the movie - they've only seen bits and pieces. 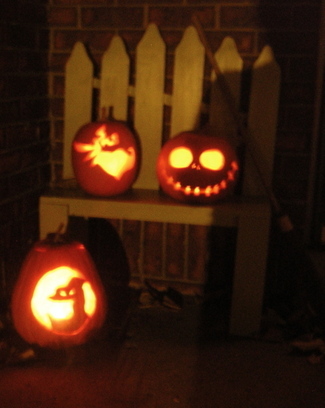 So, Aaron, Monkey, and I did the pumpkins. 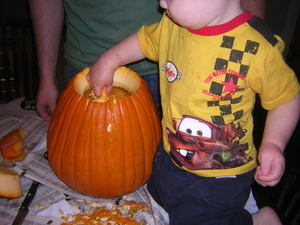 Aaron did the cutting/scooping part, Monkey did the grabbing handfuls of pulp/seeds and putting it into another pumpkin, or on the table, or on himself - he had a BALL, and I did the carving. Hope you all have fun tonight! And of course we had to make Violet a matching costume. 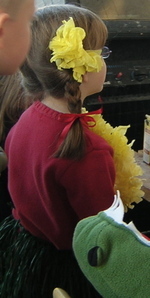 My mom whipped up a quick red sweater out of fleece scraps, we both made the skirt - I wanted to use ribbons instead of raffia so that it wouldn't fall apart and could be used longer, and Princess poked her little fingers out helping to make Violet a matching tissue paper lei. Apparently she asked my mom to make Violet a coconut top, too. She said that Grandma should make it by cutting a rock in half. Ha! Violet is the lovely doll Princess just got for her 6th birthday. It's also kind of a hold-her-over-doll until Princess saves up enough for Molly - or Emily - probably Emily. She has been such a good saver and has about $67 saved already! We told her she couldn't have one until she was eight - so she decided to get one herself. I love that. She's read most of the AG books more than once - a big fan, there. First, a rant - I HATE Daylight Savings Time! It is the stupidest thing I've ever heard of. Maybe it once had a place, but I doubt it makes any difference now - so we should ditch it, like Arizona. Can't you just picture the committee who thought up that idea? "I know, guys, we'll just have everyone set their clocks ahead one hour at the same time - that'll work!" It boggles my mind that it ever caught on - in the days before TV and the internet. Twice a year, my kids take a couple of days to adjust...... GRRRRR grumble grumble..... okay - rant over - but it had to be done - twice a year. I like to dress up for Halloween - I do, I swear. A couple years ago, when Princess was 3 and Sleeping Beauty - again- she requested that her dad be Prince Phillip, and I be Meleficent. I love Meleficent, so I made a completely winging-it, no-pattern costume - not too great, but acceptable and Princess loved it. Last year I think I might have put on her cat ears from the dress-up box, but that's about it. This year we were invited to my friend Whitney's Halloween party. I really didn't have time to even think of a costume - maybe next year? Her party was very cool, though. I'm proud to know someone who will dress as Siouxie, and her husband as Logan. You should have seen their little 3-year old Bobba Fett! Awesome costumes. I'm Being Eaten Alive. (AKA - Killer Legwarmers). 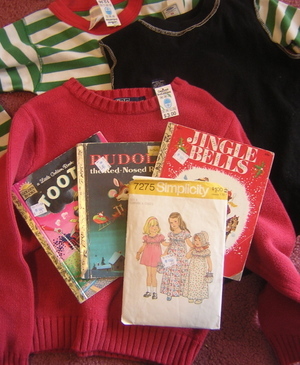 I was inspired by this site via Thimble. I got a fleece remnant (for $1) and added pompon eyes, etc. I was originally going for "Being Eaten Alive by a Snake" but it does look more like... a creature of some sort - possibly a first draft of Kermit's Evil Twin. Oh well. I thought it was funny. 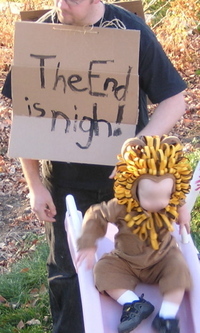 Aaron went as a Doomsayer. He actually made a tunic for himself out of a piece of burlap, but he got the burlap out of our garden and it smelled funny, so he ditched it. Still a good idea, I thought. Here he is helping Monkey the Lion on the slide, there. My mom made this fabulous costume for Thomas when he was littler - and we're so happy to get to use it again! Thomas wasn't a big fan of wearing it - Monkey LOVES wearing it! Thomas does enjoy pulling him around by the tail, though... and it does have long-pants, they had just slid up. Whitney's party was way fun. Everyone had kids under 6, so my kids fit right in. 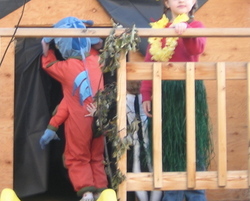 There was yummy food, a haunted treehouse, movies, a pinata, and mad-scientist experiments. To our (huge) surprise, Thomas was awesome. He played with the kids, took breaks to play cars or watch the movie, then played some more. We were pretty much expecting a melt-down at some point - but none came about - yay, Thomas! Thanks, Whitney! On Thursday we ventured out to a local botanical garden's Halloween celebration. We haven't been there for Halloween before and it was really fun! The kids made dinosaur vertebrae(!) which I thought were hilarious, they dug for 'gems', we sat and listened to some cool music from a hammer dulcimer and did some contra dancing (which, apparently is early folk-dancing, like circle dancing). The garden had a dinosaur theme this year, with 'life-sized' sculptures around - which were lit and pretty eery at night. 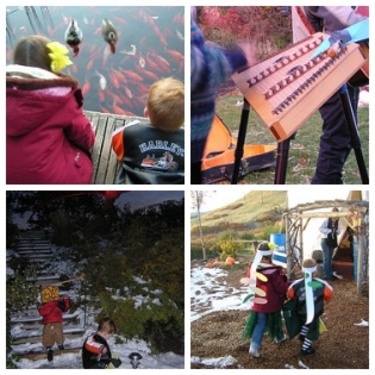 We also had to stop and admire the koi in the pond - always a favorite, and play in the SNOW. There was a lot more to do, and when we were done the kids got prizes which included passes to a special sneak-preview of Flushed Away. We're big Ardman Animations fans, so that was cool. Aaron took the kids today, and they all liked it. Monkey and I couldn't go because we promised to teach some ladies from our church how to make pillowcases, and then we went shopping. Just us two. That rarely happens, so it was fun to chat with him. I bought him a mylar pumpkin balloon which he was completely thrilled with and beat to death on the way home. 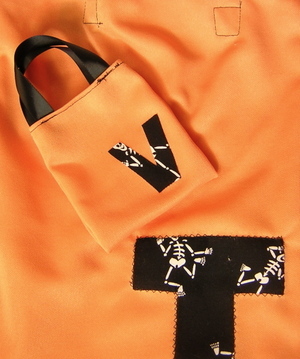 More Halloween craziness to report - probably Monday - including this teeny Trick-or-Treat bag for Princess' doll, Violet. 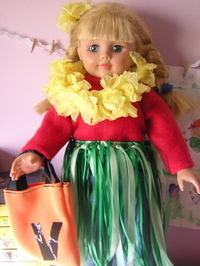 It's about a 1/6 scale replica of Princess' bag. That's right - I'm insane. So, Thomas got to wear his costume to dance class today - I did end up having to put ties on the front of his vest (black ribbon)- in part because he kept trying to take it off at first. He put on his pirate shirt and pants without complaint. Getting the vest and sash on him was a totally different story - but eventually he was okay with it - esp. as Grandma came and made a fuss about him and then we took him to see a neighbor to hype it up a little and he got to run around in the dusting of SNOW we got last night. 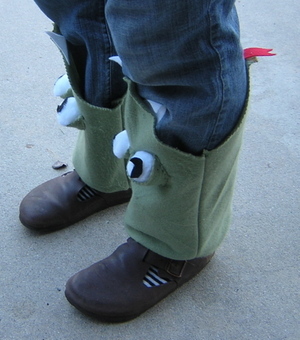 His pants are just the green cut-off sweats he usually wears to dance - I sewed on a patch (out of the same pirate fabric as his shirt) to cover up the Old Navy logo - and then added one to the knee, too. The sash is a piece of old pillowcase from the stash Eva gave me. I was going to put another piece on his head like a bandanna, but gave up - this is one pirate that won't wear a hat or a bandanna. I'm just happy he wore what he did. And of course, those are his sister's socks - but they really make the outfit, yes? 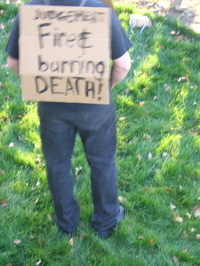 Total cost of costume = $2. I was kind of surprised anyone took more than a glance at his costume - I'm happy with the way it turned out, but it is still just a thrown-together costume - but all the moms and his teacher really liked it. They all asked if I made it..... "Well, kind of." Princess: Her Great-great-great-great-great grandmother was eaten by a basilisk .... like in the 1980's. Me: (snort) You mean 1880's? Me: That's when Aunt Kari was born. That wasn't that long ago. Me: Wait, how many 'Greats' did you say? P: Um, about five. Yes, five. She was a Y2K baby, so anything before that must seem SO 20th Century! We have changed our Halloween costume ideas. The original one was to have the kids all go as Harry Potter characters - Hermione, Ron (of course - redhead), and Baby Harry Potter. Which would have been pretty darn cute. But the Harry Potter phase has worn off quite a bit, and we really wanted to go with what Thomas was interested in. He's been playing Pirates a lot. 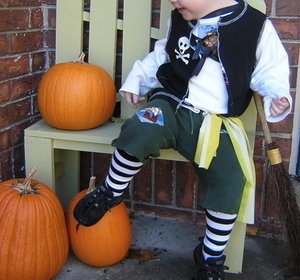 He knows pirates from playing, Peter Pan, and drooling over the Playmobil catalogues. We're not big 'Pirates of the Carribbean' fans or anything. So I bought him a pirate costume - I never buy costumes but whatever - and returned it because I think it was a little itchy for Thomas. 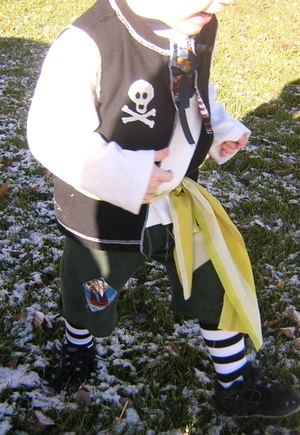 I wanted to make sure his sensory needs were taken care of - so my next dilemma was how to make a pirate costume with really soft fabrics. turned it inside out, cut off the tags, and cut it down the middle. 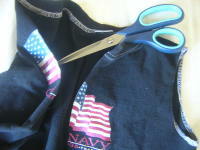 I had my neighbor serge down the cut sides for me - I don't have a serger - Thanks, Lisa! 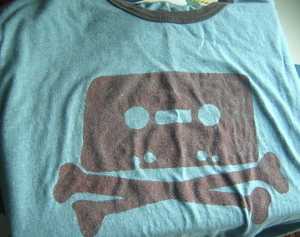 Then I freezer-paper stencilled some piratey stuff on it. Now I think I might have to sew little ties or something on the top - so that it doesn't flap open - he won't really try it on, so it's hard to tell if it will. And Yo-Ho-Ho we're ready to go! More on the rest of his costume later! Once apon a time there lived a young girl named Ravena. She was eight years old. One stormy day Ravena was practising her flute when she heard an awful noise. So she followed the noise. It was coming from the Closet. When she opened the Closet door somthing leapt from the Closet and grabed her! After that no-one saw her again. But some say they saw her ghost lurking around in corners playing the flute. So if you open your Closet door Whatch out! the Werewolf just might grab you. I only wish I could type it in the very dramatic way that she reads it! I was going to make it yesterday, and just ran out of time. I just figured I'd go without accessory- but this morning I just had to do something - my shirt was just too bare. 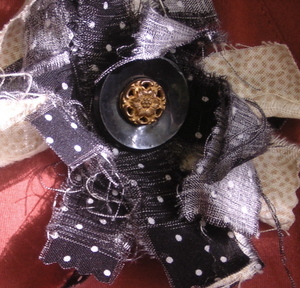 So, five minutes later - a very crazy/raggy brooch. 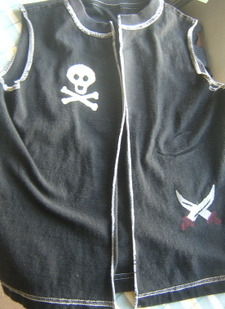 I tore the strips, arranged them - sewed a few stitches through them - sewed on a button, and a pin to the back - voila! My 5-minute brooch! The polka dot fabric is scraps from this quilt - which will not be done by Halloween - not by a long shot. Oh well. The cream is scraps from another quilt that I NEED TO FINISH. UGH. 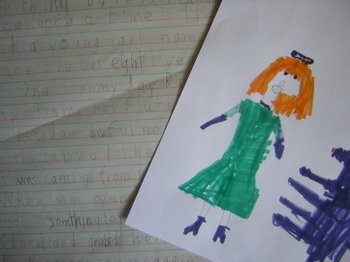 Also - check out Kiddley - those are Princess' photos of dirt and mud! My gladiolas didn't do much this year. Until lately. A couple of weeks ago (late!) 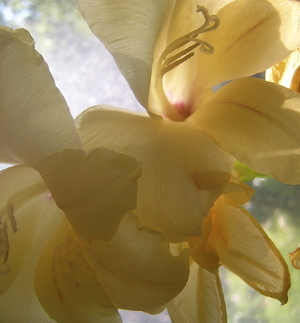 I had 2 stalks of yellow come up - I put them in a vase, as I thought they might do better inside to bloom. This week I've had the pleasure of these pretties gracing my windowsill. Now there's 2 more outside that I'll pick tomorrow. I wonder what color... It's nice to have such lovely, colorful, summery, delicate things in my home brighten my day. 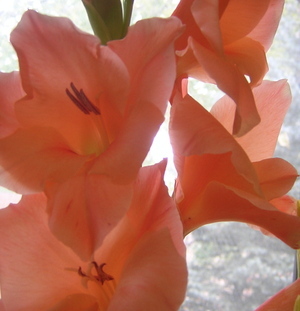 Gladiolas remind me of advent calendars. Each day a new blossom opens. This makes me happy, too: Monkey (18 mos) trying to do pilates with me this morning! :) (it was funnier on my camera - flipping back and forth between the two photos). I have SO much to do, including a lot of Christmas crafts and some overdue gifts plus Halloween costumes - so of course not much is actually getting done. Oh well. I did finish this gift - I'm fairly certain the future-owner of this shirt does not/will not read my blog. I've made this stencil before. I love it - from stencilry.org. So, speaking of Christmas, I'm starting to want to do some serious playroom-purging. I'd like to pare down some before the kids get new stuff to put in there. They always tend to be one-step ahead of me on that front. Princess hasn't played with her Strawberry Shortcake doll for a long time - I was thinking I'd be safe getting rid of that - or at least putting it away somewhere - and then, when we made her Viking Boat who did she pick to sail it? Ugh. Thomas did the same thing with another toy yesterday. One that I was keeping my eye on to see if they'd notice if it went AWOL. What to do?